I have a problem- I hate listening to people hyperbolize returns on investments- especially those specific to real estate investments. Keeping in mind that I think real estate can be an excellent investment when done right- but lets not get carried away with things. Here, let me give you an example. I received a newsletter the other day from an email list I subscribe to- normally the articles are very informative and give some great insight. This most recent article though was about investing in real estate, the author started out with: “Did you know that throughout time, the richest people in the world have all owned a great deal of real estate? “ I sighed, gross generalizations aside they probably also owned bonds and stocks too- so what? And then make the point that an investment in real-estate in 1963 would net “a 1200% gross profit” today. This graph speaks to the average US household, unless you own hundreds of properties scattered across the US you simply will not see these returns (REITs aside- keep in mind our author was talking about direct real-estate investment). The other issue I have is that there is no adjustment for inflation on this chart. 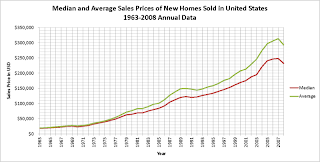 Looking at the chart it shows an average house worth $25,000 in 1963 dollars, but using an average of 4.3% inflation through these years that amounts to $180,625 in 2010 dollars. Using the 2010 average sell price of $275K this would net you a profit of $94,375 inflation adjusted dollars. Considering that you had to wait 47 years for that return I put that in the ok return pile- not the wow pile. Certainly not the 1200% gross profit our author espouses. Lets not forget all the tax you would have paid buying the house(agent fees), holding the house (government), and selling the house (agent fees again). These too eat into the potential profit. My final point, have you ever known a house that didn’t need to be rebuilt or repaired over the course of 47 years- no? Neither have I- their goes the majority of the rest of your profit. Real estate can be a good investment. Buy a property below market value that doesn’t require lots of work, in a good area, get a renter to pay the mortgage and pay you some returns and enjoy. Don’t get wrapped up in the 1200% gross profit nonsense.